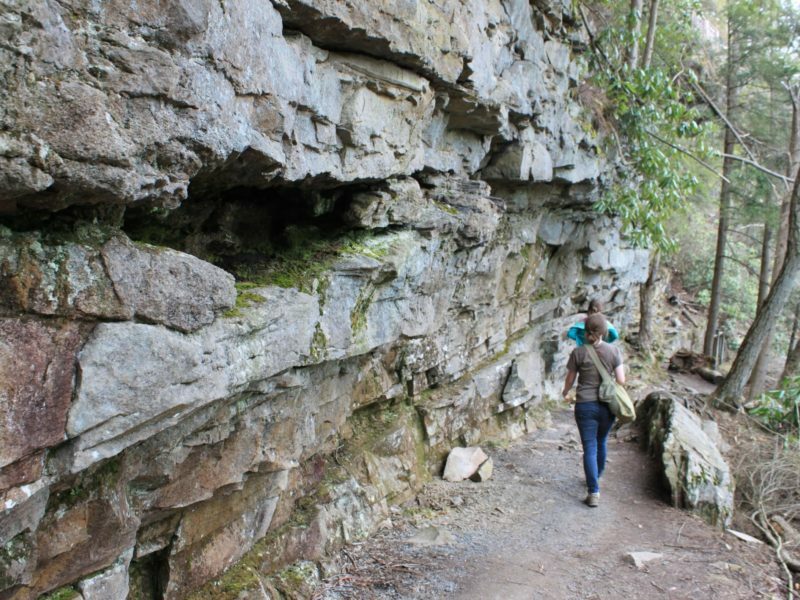 This mountain park contains some of Maryland’s most breathtaking scenery. 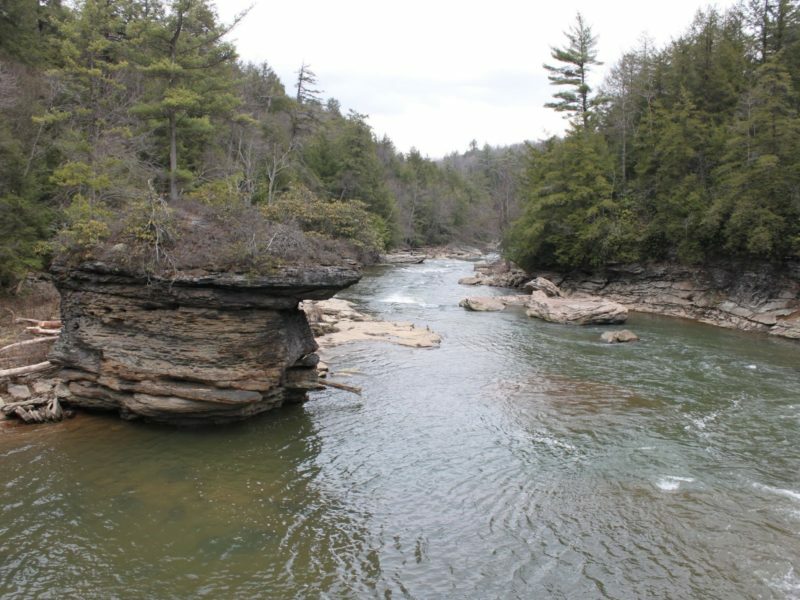 The Youghiogheny River flows along the park’s borders, passing through shaded rocky gorges and creating rippling rapids. 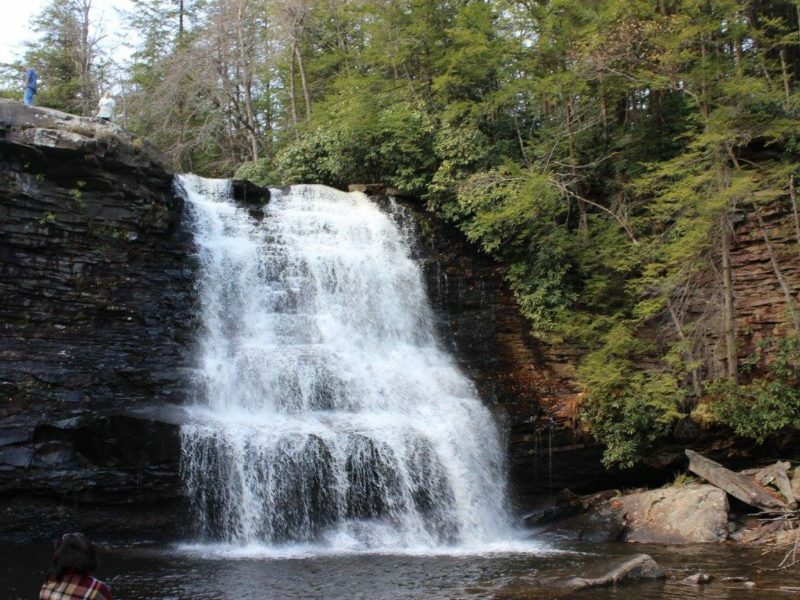 Muddy Creek Falls is a crashing 53-foot waterfall — a spectacular sight. Tall hemlocks dominate the silent woods. 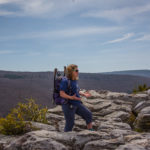 The 1.25 mile trail through Swallow Falls guides hikers to some of the most breath-taking scenery in Western Maryland. 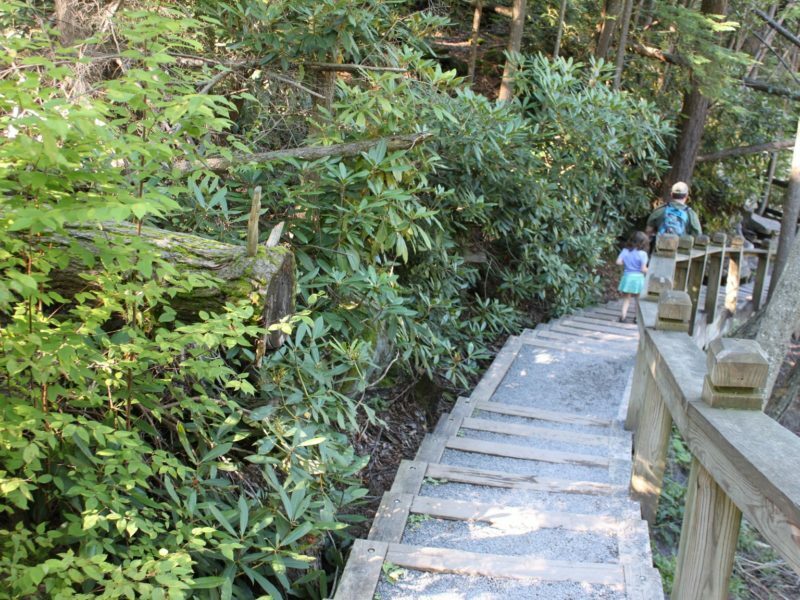 This is without a doubt the most stunning trail Maryland has to offer, especially with kids. Since it’s fairly cool here year round most surfaces can have a slickness to them and be MUDDY but we’ve seen folks in flip flops to hiking shoes. Starts at the archway and walk down the trail 10 yards and turn right at the intersection. Follow the pine and Hemlock needle carpet as you sink lower and lower towards Toliver Falls. This is not part of the Youghiogheny River so it’s not as feirce of a Falls and is excellent to splash and wade in. It’s also RIGHT next to the park entrance road so be aware of kiddos who dash. Now comes the park of rocks and will remain for almost the remainder of this short hike. 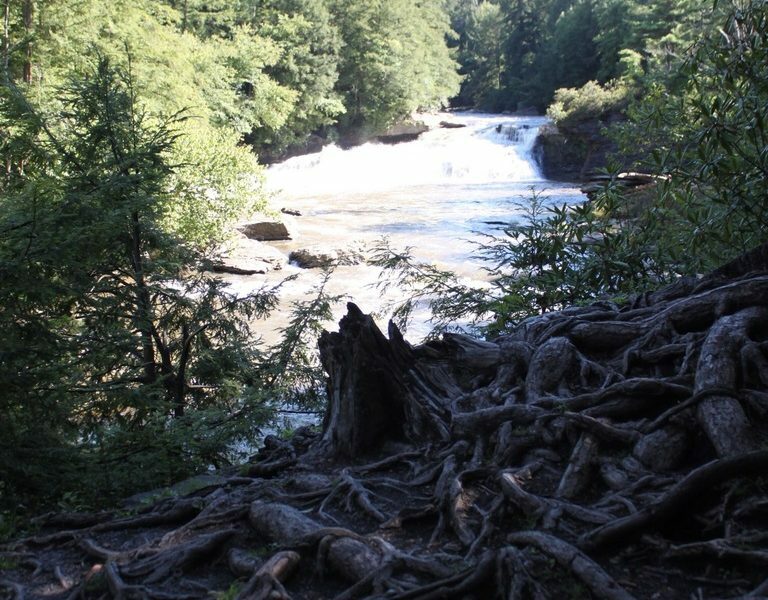 Follow the trail/rocks towards your view of Upper Swallow Falls you can swim here too, but now you’re in the Yough, and the current can be crazy dangerous and quick—-so grownups only. Keep heading down trail to the quintessential photo opportunity and viewing of Lower Swallow Falls. You can also ALMOST go out on top of it, but is also great to sit on top of thr rocks and just stare at natures raw power. The step rail here can have a wide opening so again be aware of the kids. 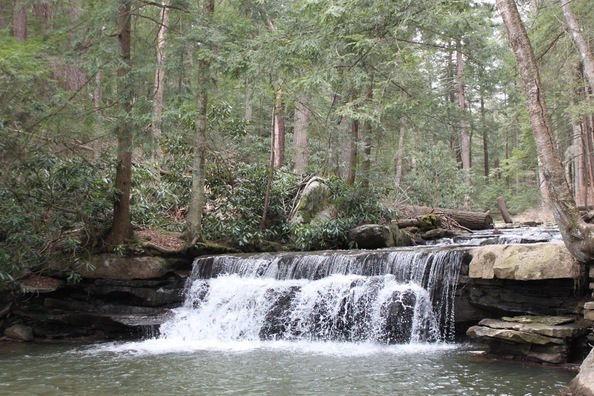 Once you head towards Muddy Creek Falls, you’ll pass by an amazing section of the stacked rock that is fun to crawl in and pretend to push upwards (Atlas). At last you’ve reach Muddy Creek Falls. Again not the Yough River but it’s a huge drop and you can wade depending on river levels. At the top of the (post staircase) you’ll head uphill and you’re back at the initial intersection which will lead you out of the park. Visitors center is a self walk through room/building with photos. The Saturday of Memorial Day weekend through Labor Day, as well as weekends in May, September and October $3/person for Maryland residents, $5 for out of state residents. All other times $3/car for Maryland residents, $5/car for out of state residents. From Route 70 west to Hancock, Maryland and Rt. 68. Follow Rt. 68 west to exit 14 at Keysers Ridge and Rt. 219. Follow Rt. 219 south 19.5 miles to Mayhew Inn Road (2 miles past Deep Creek). Turn right on Mayhew Inn Road, travel 4.5 miles to end of road. At the stop sign turn left onto Oakland Sang Run Road, travel 0.3 miles to first road on the right which will be Swallow Falls Road. Turn right onto Swallow Falls Road and travel 1.3 miles to Swallow Falls State Park, or 4.5 miles further to Herrington Manor State Park. Follow Rt. 270 west to Frederick and Rt. 70. From Route 70 west to Hancock, Maryland and Rt. 68. Follow Rt. 68 west to exit 14 at Keysers Ridge and Rt. 219. Follow Rt. 219 south 19.5 miles to Mayhew Inn Road (2 miles past Deep Creek). Turn right on Mayhew Inn Road, travel 4.5 miles to end of road. At the stop sign turn left onto Oakland Sang Run Road, travel 0.3 miles to first road on the right which will be Swallow Falls Road. Turn right onto Swallow Falls Road and travel 1.3 miles to Swallow Falls State Park, or 4.5 miles further to Herrington Manor State Park. Follow Rt. 68 east to exit 14 and Rt. 219. Follow Rt. 219 south 19.5 miles to Mayhew Inn Road (2 miles past Deep Creek). Turn right on Mayhew Inn Road, travel 4.5 miles to end of road. At the stop sign turn left onto Oakland Sang Run Road, travel 0.3 miles to first road on the right which will be Swallow Falls Road. 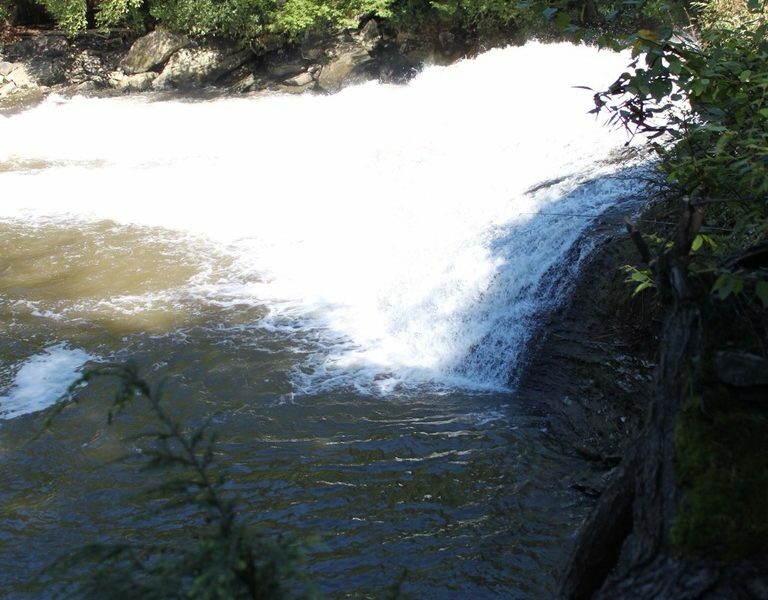 Turn right onto Swallow Falls Road and travel 1.3 miles to Swallow Falls State Park, or 4.5 miles further to Herrington Manor State Park.